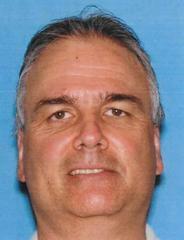 Missing Person: Alfred Fiume, 53, WM, 5'10", 260, brn eyes, brn hair. Last location: Monroe Twp. Alfred "Fred" Fiume, 53, white male, 5'10", 260 pounds, brown hair, brown eyes was last seen on July 26, 2015 at 9:30 p.m. Mr. Fiume did not show up for work today in Jamesburg, N.J.
Mr. Fiume's cellphone was pinged in the area of Gravel Hill Road, Monroe Township this morning at 7:57 a.m. He may be operating a blue, 2007 Toyota Corolla with N.J. license plate C37ATM. If you have information that can assist in helping safely locate Alfred "Fred" Fiume, please call 911 or contact the New Jersey State Police Missing Persons Unit at 609-882-2000 ext. 2554 or Rutherford Police Department at 201-939-6000.